Have you just been diagnosed with diabetes? Or, have you had diabetes for a while now – either diagnosed or undiagnosed –so that now it must be managed? 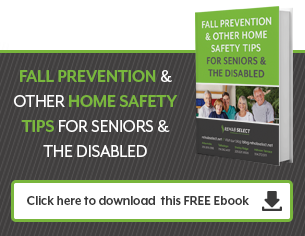 If you have ended up in the hospital as a result of diabetic complications and need to go to a skilled nursing facility once you are stable enough for discharge but not well enough to go home, don't be discouraged. This is called "post-acute" care, and your doctor may decide that it is necessary. It is also an opportunity for you to learn how to manage your disease well, with your family's help. Nearly 26 million Americans have diabetes today, with more diagnosed every year. About 50% of Americans are expected to have diabetes by 2020. Of those with the disease, only 19 million know they have it. Seven million don't yet know. If you were in the latter group and are now diagnosed, know that this is not life-threatening; you can now be given the tools and knowledge to manage it so that you stay healthy. Uncontrolled, diabetes increases your risk of heart attack, heart disease, stroke, and high blood pressure. Even with management, you are still at greater risk for these diseases than the general population. That doesn't mean you should lose hope, though. You can learn how to manage your disease with the help of a skilled nursing facility if you choose. 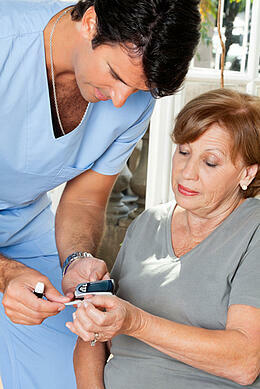 How can a skilled nursing facility help you with diabetes management? Measuring blood sugar, taking insulin and other medications as necessary, exercising and learning how to eat properly are all part of diabetes management. If you are asked to go to a post-acute care facility after your diabetes diagnosis to get the disease under control before you go home, use it as the learning experience it is. You have access to top-notch professionals who can help you get your diabetes under control so that you can manage it instead of having it manage you. Controlled properly, diabetes can become a manageable disease that you'll learn to simply take care of as a matter of course. It does not have to significantly impact your life. Your family, too, will be asked to participate as you learn about your disease and how to manage it. Skilled nursing facilities know that diabetes management is a family affair – and when you become healthier, your family often does, too. Your healthy diet and lifestyle habits can rub off on your family, in a good way. Sometimes other health conditions develop as a result of the diabetes. In this case, you may need occasional inpatient or outpatient services to help you continue to manage your disease and maintain an active lifestyle that's as healthy as possible. Skilled nursing facilities are often cost-effective options to hospitals for those occasions when you have to manage your disease either as an inpatient or outpatient. For example, if you're diagnosed with kidney failure, you may be hospitalized as an inpatient to start dialysis treatment until you are stable. Once you are stable, you may move to a skilled nursing facility for further treatment, then continue dialysis treatments as an outpatient if needed. Community-based skilled nursing facilities can be cost-effective options to hospitals in that they can provide post-acute diabetes management, education and care less expensively than hospitals can. They're also closer to home, which makes it easier for you.